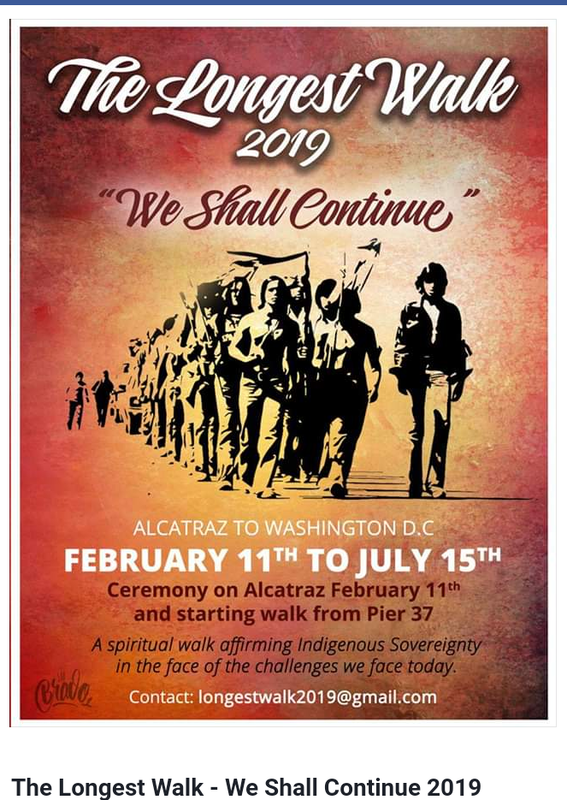 The Longest Walk: We Shall Continue has been initiated to address the major threats to American Indian and Indigenous Peoples and Nations. This is a spiritual Walk for all Indigenous Peoples and our allies. In 1978, The Longest Walk came about as a way to confront eleven (11) anti-Indian bills in Congress. This included a bill that proposed abrogating all Indian treaties. In 2019 we are facing a renewal of serious threats to our children, women, lands, waters, sovereignty, and even our Indigenous Knowledge. Along the way we want to hear about issues that can be placed within these eleven themes. We also want to encourage those who have been on previous Walks to share their story, as well as hearing from communities along the way that also have their own stories to tell. Upon arriving in Washington DC we will convene some discussion on these issues, with the intent of finding common ground among issues that the diversity of Indigenous Peoples Nations and organizations can agree upon. It is our hope that these discussions will occur in many places at the same time, with distributed actions, and that we will network all of them together into an addition to The Longest Walk Manifesto. Because of the significant threats to our Peoples, many of our actions are in reaction to what nation-states and corporations do to us. These important defensive actions have played a major role in preserving what we still have. Our hope in finding common ground on some of these issues is that we can collectively engage in strategic thinking and coordinating amongst ourselves. No matter what is placed in our way, no matter what attacks happen, no matter how difficult things may be…We Shall Continue. Donate to the Longest Walk 2019. The walk's fiscal sponsor, Seventh Generation Fund, has set up this account below on link for walk donations. So proud of my niece Anelina Manriquez walking with We Shall Continue. I will be praying for all of you for a safe journey. What is the route? ?.i cant find anything on the net about the exact route?? Trying to send donations through PayPal. Do you not have this option? The link for the walk donations is added now in this article. Thanks.